2) Whisk together the dressing ingredients until well-mixed. 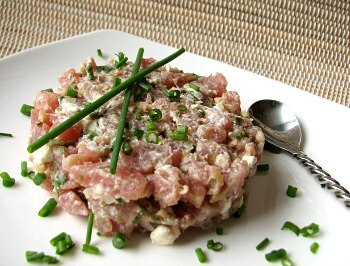 Pour over the tartare and mix gently with a fork. Taste and adjust for salt. 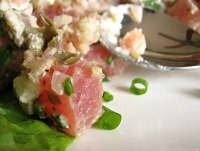 3) Serve immediately on chilled plates with extra chives for garnish. This entry was posted in Books, Photos, Recipes, Seafood by Annie. Bookmark the permalink. The thing is, it still looks amazingly good, because none of us have your vision to compare it to. The opinions of family members are over-rated, anyway. Best to always get an outside opinion! I instantly want this, and I’m wild about your idea of warm fruit on the side. Plus, I love the cocktail stirring spoon in your fancy-hat pic. cookiecrumb: I admit the fruit isn’t my idea, I had a tapas dish of tuna with grilled pineapple on top. It was great. Kalyn: It’s definitely suitable for your style of eating. I just started to diet and this recipe looked really good. Absolutely fantastic flavor! My son and I made romaine lettuce boats stuffed with it. We were both impressed.